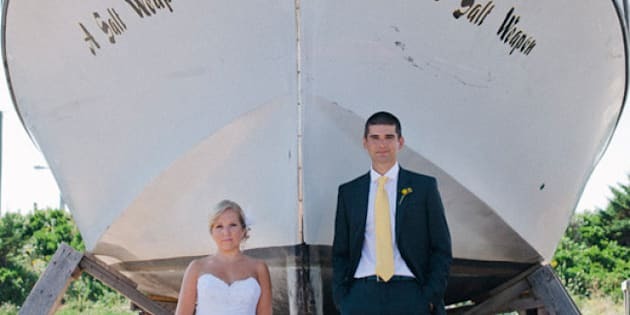 If you're dreaming of having a nautical-themed wedding, you ought to take notes from this East Coast beauty. Erin and Cameron had a modern seaside wedding on Erin's parents' property in Prince Edward Island. The decor was nautical-inspired without giving guests the impression they'd just stepped onto the set of Gilligan's Island (we especially love the chevrons and the modern grey, yellow and navy color palette). After dining on mussels and other local fare, party-goers enjoyed breathtaking ocean views as they danced the night away. Scroll down to see the gorgeous images captured by Wild Eyed Photography. From the bride... "Our wedding day was exactly what we wanted. We had perfect weather (despite the coldest summer in recent years), in the ideal location with our family and close friends. The wedding was set in eastern Prince Edward Island at my parents' home. It is without a doubt my favorite place in the world. My parents purchased the land when I was in high school. I always knew that this is where I would get married. It was a true family affair with our wedding party consisting of my sisters (bridesmaids) and my husband’s brother (best man). One of my brothers performed a live processional and recessional. The other did an amazing reading. My eldest sister’s boyfriend served as MC and brought down the house with his Stuart McLean impressions. The wedding day would not have come together without one of my best friends, Meghan. Meghan designed everything based on our color scheme of grey, yellow and white. This blueprint flowed gracefully through all aspects of the ceremony, reception, and dance. Meghan was responsible for the professional and fun feel of all the print media including the save the dates, invitations, RSVPs, menus, programs and seating cards. We wanted a really fun party. The basics included an open bar, live music and great local food. I used Etsy for some quirky photo booth props and the wedding party's jewelry. During cocktail hour we held mini bocce ball and croquet tournaments. The evening was tempered by several fantastic speeches done by my sisters and brother in-law. In true east coast fashion we danced on the tabletops well into the morning." Click here to get daily inspiration for your big day or download 2's awesome wedding apps (iPad & iPhone). “Like” us on our 2life Weddings Facebook page.